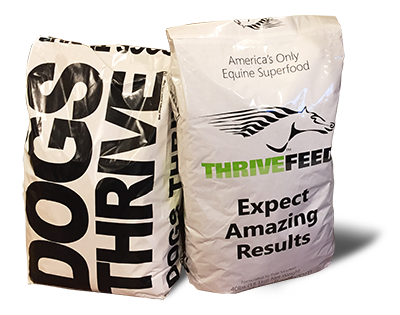 ThriveFeed for equine and now we are offering ThriveFeed for canine. Pure natural ingredients. Non-GMO grains, ultra low sugar and no raw starch. No cheap Sun Cured Alfalfa. No GMO grains. No cheap filler by-products like ground roughage products soybean hulls, rice hulls, peanut shells. No corn with deadly aflatoxin risk. No Beet pulp, Wheat middlings, or any low cost fillers. Just the very best ingredients skillfully processed. Grown and manufactured in the USA. 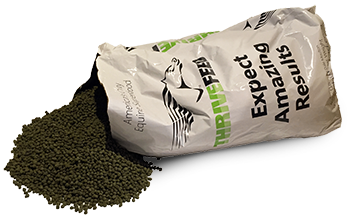 Supreme quality, low temp dehydrated Alfalfa, chosen for its bio-available calcium, high quality protein and highly digestible fiber. A staple food for over 500 million people in 30 countries. Once processed, it supplies a high quality nutrient source without common raw starch behavioral changes. This is grain Sorghum, not sugar Sorghum used to make syrup and ethanol. Accepted as one of the finest grasses available for horse nourishment. Chosen for its contribution to quality nutrition. Whole soy meal has a balanced amino acid profile that compliments the amino acid pattern of Sorghum. The inclusion also supplies viable amounts of essential fatty acids. Antioxidant rich, rice bran has been the target of long term interest in the well being of those that value abundant energy and longevity. which is why it’s in the formula. Due to its combination of both macronutrient, N, P, K, Ca, Mg, S, and micronutrients, Mn, Cu, Fe, Zn. This special kelp is a powerful addition to the formula. It is also host to cytokinins, auxin-like gibberellins, betaines, mannitol, organic acids, polysaccharides, amino acids, and proteins. For more detailed information, and FAQs, visit the manufacturer’s website here. Manufacturer’s Guarantee. 100% money back guarantee! If you feed for 30 days as recommended, and do not have positive results, please contact us. 100% money back guarantee! Feed for 30 days as recommended, if you do not have positive results, please contact us.